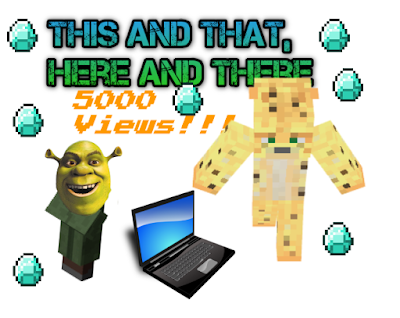 5000 Views Special- Behind the Scenes, More of My Official Youtube Channel, & More! I have officially reached 5000 views! It took some effort, but I had a great time doing it. And now, finally, I have a special post about it. Our first milestone was 1000 views. Now that I have reached 5000, my next goal will be 10,000. And then 20,000. But once again, I am getting a bit ahead of myself. So instead of a timeline, like the special post for 1000 views, I will be doing a behind the scenes post, and what to expect in the future type of thing. I don't even know whether or not it should be called a behind the scenes, because you are reading this, not watching this. So it might be a behind the posts. Maybe. But enough blabbing on and on, time to start it! Every afternoon, I start working on my post for the next day. This way, I am ready ahead of time, and can publish it in the morning, so you see it all day. Sometimes, I make two posts a day, one being a quick message, where I discuss technical things. My dad checks my posts, and publishes them so all of you can read it. In order to make the custom images on my blog, I play around with Google Drawings, montaging photos on top of each other, adding text, and finishing it off with my logo, so you know that I made it. I have also made concept photos like this. If you wish to see my post on how to do this, click here. To make my logo, I used cooltext.com. I have also used flamingtext.com for animated text and more advanced text. These are very cool tools, and I highly recommend them. In the future, expect to see more posts, some merchandise such as t-shirts etc., and my blog being a bit more popular.